So we never try to ask much of our fans but we could REALLY use your help. 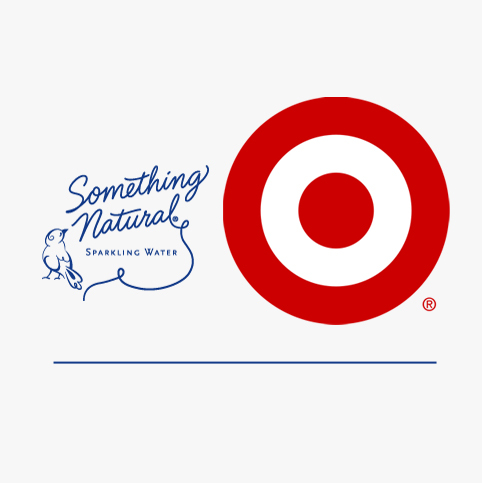 Select Target locations in California are now test marketing Something Natural (YAY)..if the product sells really good they promise to expand our waters into more stores all around the country. So, if you could show your support by picking up a bottle or 2 in any of the locations listed below, we would REALLY appreciate it! Also the price per bottle is only $1.69 so you get a great deal! Soda is a sneaky beverage. It tricks so many into thinking that it’s okay to drink and that it hardly affects your weight but the truth it – it totally does! Your pants may continue to fit fine but what is going on inside your body is not fine. In fact a study found that people who drank soda every day for six months saw a 132 to 142 percent increase in liver fat and a 117 to 221 percent jump in skeleton fat. Yikes. 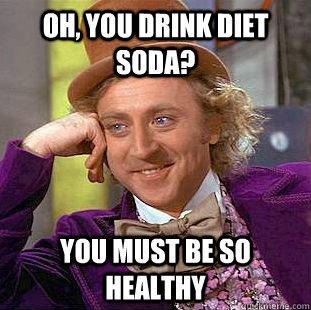 Diet soda does not have as many calories, carbs or sugar as regular soda, which makes it easy to believe that it’s a fairly healthy alternative. Unfortunately this is false. Just because it’s “diet” doesn’t mean it’ll help your diet. Researchers from the University of Texas Health Science Center monitored 475 adults for 10 years, and found that those who drank diet soda had a 70 percent increase in waist circumference over the 10-year study, compared with those who didn’t drink any soda. An average can of soda contains the equivalent of 10 teaspoons of sugar. This gigantic form of liquid sugar skyrockets your blood sugar levels and can cause an insulin reaction to the body. Over time, the consumption of soda can lead to diabetes, insulin resistance and of course weight gain. There’s no need for an abundance of sugar consumption when many refreshing alternatives exist. Still stuck on “10 teaspoons of sugar”? Yea, we are too. Phosphoric acid sounds yummy doesn’t it? This delicious acid actually interferes with the body’s ability to absorb calcium and can lead to osteoporosis, cavities and bone softening. When you are trying to maintain a healthy lifestyle, the last thing you want are soft bones. PS. Our products do not contain bone softening acid or large quantities of sugar– that alone is reason enough to try us out! We all hear them. These wild facts flying around about what we should or should not put in our bodies. When the information hits close to home, we decide to hit you with some knowledge! So here is a list of myths about carbonation that are just fizz! 1. Carbonation leaches calcium from your bones! This myth is only connected to soda drinking. It actually comes from a study where the test subjects either drank carbonated or distilled water for an entire 8 week period. Luckily, results came back equal for all participants. We say: Why mess with soda at all when a healthy alternative exists? 2. Carbonation will rot your teeth! Drinking all those bubbles can’t be healthy for your teeth can it? Carbonation will make your teeth deteriorate and fall out, won’t it? Nope, you’re in luck! Carbonation itself has not been linked to tooth decay. Scientists even went as far to soak teeth in still and carbonated water, and still there were zero findings of harmful effects to the teeth. BOOM! 3. Does carbonation cause cellulite? No, carbonation does not cause cellulite. This myth is usually related to high caloric and sugary drinks. Lucky for you at Something Natural all of our tasty drinks have 30 calories and seven grams of sugar per bottle, keeping you looking great and cellulite free. 4. Carbonation is harmful to your stomach! They say those highly carbonated beverages are just tearing apart your insides. Don’t believe everything everyone tells you. Carbonation is not destructive to your stomach or throat. Several studies were completed to support this. One study took dozens of subjects with indigestion and divided them into two groups. Group 1 drank a liter and a half of still water every day and the Group 2 drank a liter and a half of carbonated water. When two weeks passed, almost all of the people who were drinking carbonated water actually reported less indigestion. In conclusion, have no fear of fun refreshing bubbles! It’s time to clear our minds of all assumptions and myths related to carbonation. 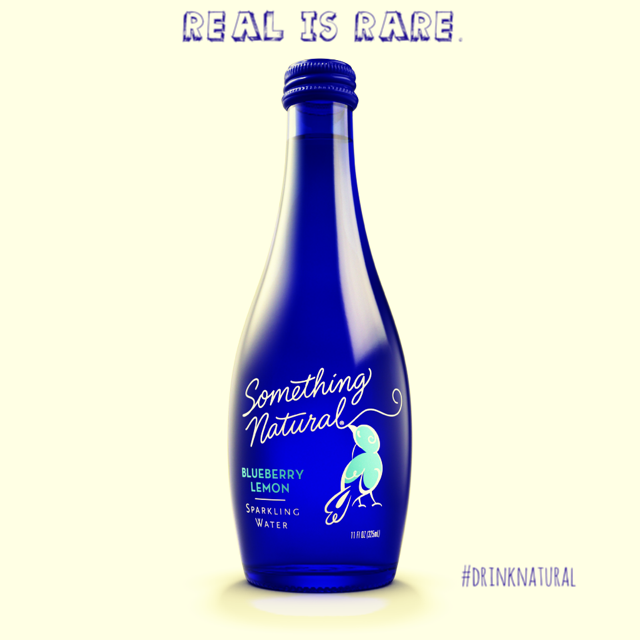 Something Natural is a refreshing beverage consisting of far less calories and sugar than your average drink brand. The words healthy and natural can stand strong alongside carbonation. Love our Black Cherry flavor but looking to spice it up a bit? 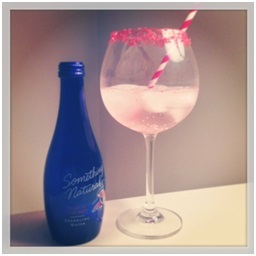 We’ve got a great idea: add a sugared rim! Whether you’re hosting a party, or simply giving yourself a special treat, this is an easy and fun way to add to an already delicious drink. Step 1: Pour a tablespoon of crystallized sugar into a small bowl, add two drops of black cherry extract, or less than one teaspoon of black cherry concentrate, and mix until color is a dark red. Step 2: Pour mixture onto a small plate and spread it evenly across the surface. Step 3: Pull out the fanciest wine glass you have, (because what’s more fun than drinking out of a snazzy glass? ), and lightly wet the rim with lemon juice (lemon helps the sugar stick). Then tip it over into the mixture, creating a colorful, healthy AND very tastyglass rim. 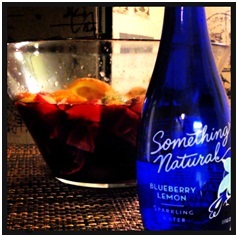 Step 4: Add ice, Something Natural Sparkling Water Black Cherry and for fun, toss in a striped straw!